As comedians Laurel and Hardy said: “Well , here’s another nice mess you’ve gotten me into “….. Why so many? Why endless dead ends and unanswerable conundrums? If we’d written fiction to demonstrate that the Party political, system with elected ‘representatives’, is totally unfit for purpose, it could never have been as well put together as the farce we see before us. Elsewhere that mashup of fact and fiction is becoming reality as 41-year-old Volodymyr Zelenskiy, who plays a president in a popular Ukranian TV series, gained twice the vote of his nearest rival in the first round of Presidential elections. He’s following in the footsteps of M55 Five Star Movement in Italy, founded by comedian Beppe Grillo, which gained more votes than any other party in 2018 elections. Do the people really want to have comedians in charge? Well, if it’s going to happen, why not have a professional comedian rather than those who fall into that role by mistake? 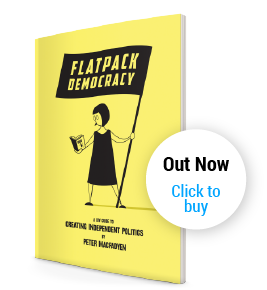 A similar idea comes from Greta Thunberg ‘….and since our leaders are behaving like children, we will have to take the responsibility they should have taken long ago’. Let the children and fools step up. Her powerful words remind us constantly that the system and leaders we have somehow chosen are simply not capable of dealing with the complexities of Brexit, let alone climate change. At the root of all this is the gap we have built between the representatives and the people. (Which is inextricably intertwined with the ever increasing gap we have created between rich and poor.) The latest of John Harris’ Anywhere but Westminster short films comes from Wigan where a significant majority voted to leave the EU. Despite everything we now know, most of the people John talks to would still vote leave. He concludes that ‘the tragedy of Brexit is that places like this have been all but forgotten in the Westminster drama, more than ever they have things to tell us and we ought to listen’. Listening is the key. The energy of 6m people voting and 1m marching last week is all redirected into anger and frustration when it is met with someone’s fingers in their ears. The tragedy is that this will not change quickly. I don’t see it change with a different government either because they are all so entrenched in the current system. The new Independent Group of MPs ‘Believe that our parliamentary democracy in which our elected representatives deliberate, decide and provide leadership, held accountable by their whole electorate is the best system of representing the views of the British people’. Based on current form, they are simply wrong. We cannot wait to be ‘consulted’ then ignored. On the largest issue life on earth faces, Extinction Rebellion (XR) has clearly recognised this and head for London on April 15th to demand change. And at a local level, Frome’s Independents (ifF) have taken initial steps in showing what can be done by committed and organised locals outside of Party Politics, looking to change the focus to inclusive participation and ownership of decisions by the community. Placing these together in one paragraph is very deliberate. If we have any chance of facing the climate emergency without extreme chaos, it will be through political engagement at a community level (the sort of work the Alternative UK and her partners are embarked upon in Plymouth). 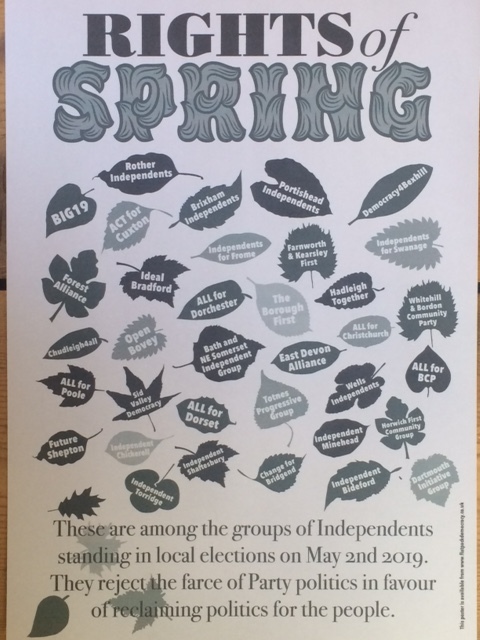 IfF return to the polls on May 2nd, along with at least 40 other groups of Independents in other towns – committed community activists who have had enough of not being listened to. I believe both these Movements are essential, the high profile approach of XR, alongside a steady tidal wave of people reclaiming politics. Reclaiming it not only from the Political parties, but from the money which funds their dominance.